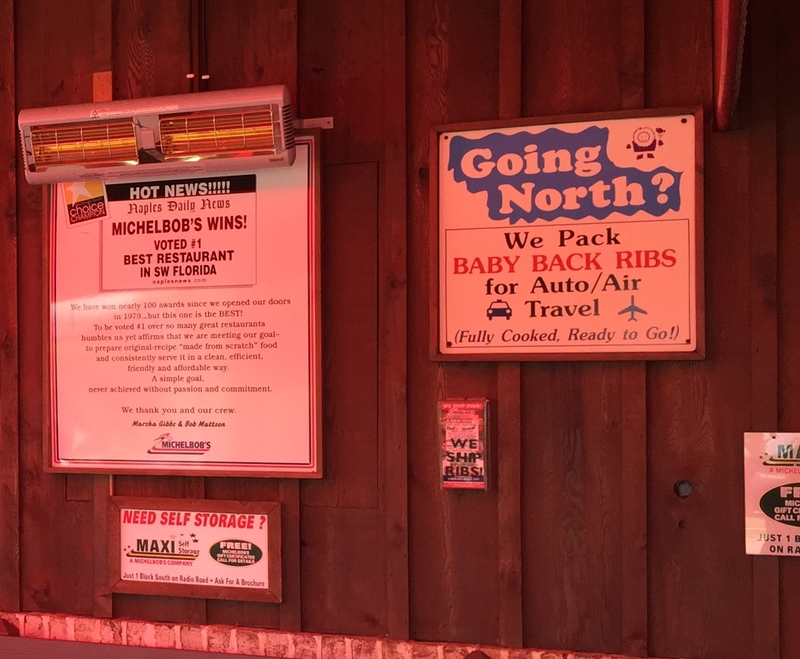 Another venture today into Florida BBQ brings us to a local staple for some 36 years in Southwest Florida: Michelbob's Restaurant ( or sometimes just Michelbob's Ribs). Although they serve a full array of BBQ foods, they pride themselves most on their pork ribs. Their unique take is that the ribs are imported from Danish hogs that give the meat a distinct quality from North American pigs and then slow-cooked their way to make them a especially tender. The other hallmark is their BBQ sauces - which apparently won several awards. So if you are a purist in your barbecue taste, be warned that they will play a part in this review. The sauces at hand were three - sweet, spicy, and tangy; to me these equated to being a sweet, maple style; a peppery one; and tangy was more mustard-like. Of the three, I found the Bold & Spicy to be the best of three for enhancing the foods I ate. I can't really judge the merits of the sauces' pedigree; just looking at how it compliments the food. Michelbob's is a restaurant-style place that looks part-diner; part-lodge with it's dark, wood-framed interior. This is offset by the huge collection of bright, Coca-cola memorabilia; orange-crate art; and an assortment of fresh-water fishing pictures and mounted fish trophies. (Considering that one of the owners is originally from Minnesota, there's definitely a northern Midwest quality.) It makes it for an eclectic feel if you are used to Texas-style ranch looks of light stone, wrought iron, and brushwood in your BBQ joints. The smoker wasn’t visible, but I did find out that they use oak wood in their smoking process. Food is best ordered as a combo plate to get the most for the money, but you can also order large "dinner paks" portions (instead of by the pound) to go. You can also have the their signature ribs shipped to you overnight (more on this later). They serve chicken, pork (sliced and pulled), sausage (mild, spicy, and jalapeno cheddar), sliced beef, baby-back pork ribs, and grilled steaks. We'll look at the ribs, chicken, sausage, and sliced beef. Chicken: I'm going to discount this one right off, because unfortunately it was a grilled chicken breast not the smoked chicken. A mistake on my part in ordering - it tastes perfectly fine but isn't true barbecue for this review. No score. Sausage: I decide to go with the mild this time around (apologies for the lack of a snapshot). There's a nice snap to the casing and the meat is juicy. The meat is smooth and not crumbly like some sausages. Flavor-wise, it is just as expected, a very mild flavor with only a hint of smoke. This is a case where the sauce really helps - bringing out some good accents but not overwhelming. Without sauce: 5.0 out of 10; with sauce: 6.5 out of 10. Sliced Beef: Michelbob's doesn't have a true brisket, so I go with the sliced beef instead. This turns out to be surprisingly good - there's a nice ring that gives it a consistent, mild smoky flavor. While it lacks any fat, it is surprisingly tender and a little moist without any sauce. With sauce (especially the spicy), the flavor is enhanced instead of smothered. I lean towards: 6.5/10 without sauce; 7.5/10 with it. Pork Rib: The baby-back ribs start with a crispy bark that has some sweet spiciness to it. It might be a rub, but tastes more like a glaze they would add last in their cooking. And then you hit the meat with a contrast of good smoke as the meat comes off tender and juicy. Everything rolls off and melts in your mouth just right - there's definitely no need for sauce on these (and I didn't try in any case). If there's any complaint, it's that the meat amount is inconsistent. Still, it was very satisfying for a guy who isn't necessarily a fan of the rib. Easily their signature dish is their best: 9/10. Is it worth a visit? Yes. All the food was good, and I didn't even hit on the sides which were pretty good as well. It's got a nice, local charm to make it interesting to check out in any case. I could imagine the American Pickers would love it just for the memorabilia. Is it worth a trip? Only if you really love ribs! Otherwise, not really for a full BBQ experience. But there's a twist when it comes to Michelbob's: they will ship their ribs overnight if you order on time. They come fully cooked; just thaw, heat and serve and they will be just as good. So, that trip might not be necessary . We may try and test this claim by shipping an order from Florida to Texas for Tom and Scott to sample. (Stay tuned). So overall, Michelbob's does one thing really well, and the rest are good to middling. With their emphasis on pork and the sauces, I would say their style falls closer to Carolina-style than a Texas-style of BBQ. Not seeing anything in your post (or on their web site) that indicates they are Carolina style at all. Ribs are not big here. Places do them, but in the Carolinas, the word "barbecue" means pulled pork. Also the sauces do not look to be a Carolina style. Sauces here vary regionally, but they tend to be vinegar based (as in clear, almost all vinegar with sugar and hot pepper but no tomato at all) in Eastern NC, to vinegar with some tomato in the western half of NC and SC, to mustard based in eastern SC. None of their sauces seem to fit any of the Carolina archetypes. Maybe they are more Memphis style? Or maybe, since the owners are from Minnesota, they are none of the above. With the emphasis on the pork they pushed in their restaurant, I kind of leaned towards Carolina style of "if it ain't pork, it ain't BBQ" philosophy. But I suppose Memphis style might be more appropriate given their love of ribs. Or, none of the above might work since it is a very eclectic mix.